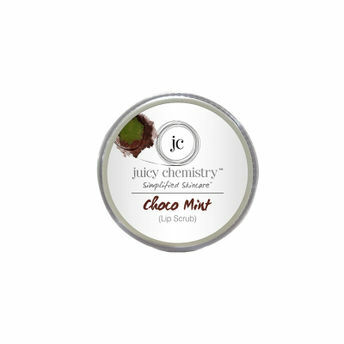 This double-action Juicy Chemistry Organic Choco Mint Lip Scrub gently buffs away dead skin, provides intense hydration, and rejuvenates dry lips. Nourishing shea butter, rich avocado oil and soothing peppermint essential oil gently address the dryness and help seal in the moisture. This classic combo of chocolate and mint will please the chocoholic in you! Explore the entire range of Lip Scrubs available on Nykaa. Shop more Juicy Chemistry products here.You can browse through the complete world of Juicy Chemistry Lip Scrubs .